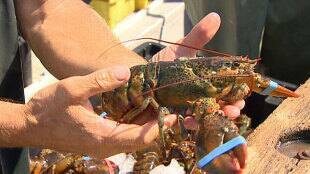 The federal Fisheries Department says $4.1 billion worth of Canadian seafood landed on tables in more than 100 countries last year, with lobster remaining the most valuable export. Fisheries Minister Keith Ashfield said Sunday that Canada exported $41 million more in fish and seafood products in 2012 than the year before. "The strong exports in 2012 demonstrate the trust consumers place in our fish and seafood products worldwide," he said in a statement. More than 60 per cent of Canada's seafood exports were shipped to the United States last year at a value of $2.6 billion. But the department said China and the European Union remain major markets, each taking in hundreds of millions of dollars worth of Canadian seafood products last year. The federal government is calling for a trade agreement with the EU that would scrap costly tariffs on most fish and seafood products. Gerald Keddy, parliamentary secretary to the minister of international trade, said he hopes to gain support for a trade deal while attending an international seafood show in Boston this week. "Canada has a historic opportunity to gain preferential access to the European Union, a 500-million consumer market and the world's largest importer of fish and seafood, importing an average of $25 billion annually," he said in the statement. Aside from lobster - which accounted for $1 billion of Canada's overall seafood exports last year - the department said snow and queen crab, Atlantic salmon and shrimp were among the country's most valuable. New Brunswick was Canada's largest exporter of seafood last year, with exports valued at $967.2 million, followed by Nova Scotia at $915.4 million and British Columbia at $871.5 million. The department said some 80,000 people work in the industry, including commercial fishing, aquaculture and processing.